My mother-in-law bought this Sort and Snap set for my son a few weeks ago and we are loving it! Whenever we have a free moment my son says, "Do you want to play stamps (snaps) with me?" 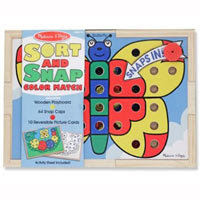 If you're looking for a fun little activity to practice sorting, color matching, and color recognition... while also learning about patterns and developing fine motor skills, this is an awesome pick. The snaps can definitely be tricky to pull out, so this is great for strengthening finger muscles too. Any other favorite toys for older two-year olds or three year-olds? I am always looking for good birthday present ideas. As you can see... still no posts with fun activities. Hopefully this weekend. The curriculum I'm creating for my 5th and 6th grade students probably wouldn't be too interesting for all of you. Fortunately my son is content with playing with snaps, playdough, and looking for snails at the park this week! Have a fabulous Labor Day Weekend! !